A Calgary police officer shot a man early Saturday morning while responding to a suspected armed home invasion. A police officer shot a man in the driver's seat of a vehicle that was allegedly fleeing what police are calling a "targeted" armed home invasion. The Calgary Police Service says the man who was shot was taken to hospital in life-threatening condition and remains in critical but stable condition. He's believed to be in his 30s. He was shot around 1:40 a.m. MT on Saturday, within 10 minutes of police arriving to the 2700-block of 86 Avenue S.E. in Calgary to investigate a call about an armed home invasion. "These situations that unfold rapidly … present our officers with difficult, split-second decisions," Acting Deputy Chief Ryan Ayliffe told reporters at a press conference. Police found two men in a vehicle believed to have been fleeing the scene, he said. An officer fired his gun and hit the driver. The passenger, believed to be in his 20s, was not injured but police took him into custody. The officer has not been identified by police and is described only as a six-year member of the force. They found a third man injured inside the home. Police believe he did not live there but knows those who did. He's believed to be in his 20s and is now in hospital in serious but stable condition. "We believe that there was shots fired at the residence," Ayliffe said, adding they did recover a firearm. The Alberta Serious Incident Response Team has been called in to investigate the shooting. That ongoing investigation limited which questions Ayliffe answered. He said he couldn't comment on the relationship between the suspects, the injured man and those who live in the home, nor would be say why police believe it was a targeted home invasion. 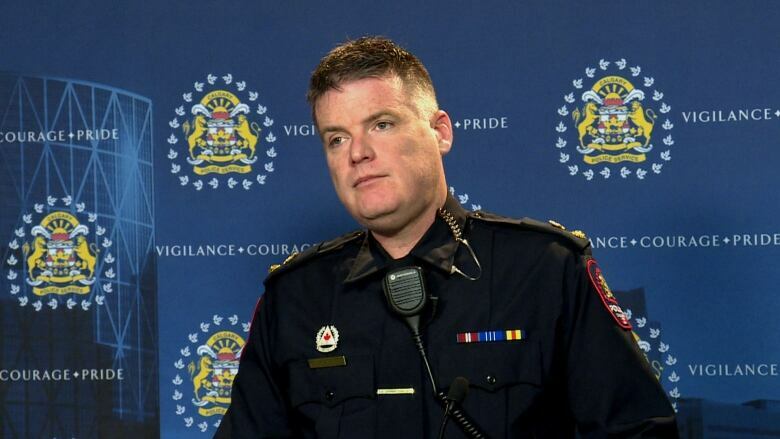 Calgary Police Service was investigating whether other suspects were involved. "Based on what I know at this time the members involved in this situation acted with professionalism, courage and compassion," Ayliffe said. "And I have every confidence in their ability to keep our community safe." He said the officers involved are being offered "every available support" and none were injured.